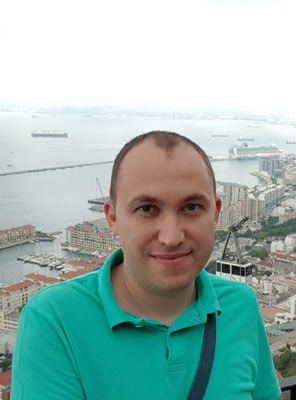 My name is Ion-Augustin Giosan and I am a computer science engineer. Date and place of birth: March 20th, 1984 in Alba Iulia, Romania. Known foreign languages: English (B2), French (A2). STEREOCLASS (dense STEREO based object tracking and CLASSification for pre-crash applications) - with Volkswagen A.G.
STEREOPED (dense STereo based object detection and PEdestrian classification in traffic environments) - with Volkswagen A.G.
DESPED (DEnse Stereo PEdestrian Detection in urban environments) - with Volkswagen A.G.
Super-sensor for 360-degree Environment Perception: Point Cloud Segmentation Using Image Features, Proceedings of IEEE Intelligent Transportation Systems Conference (ITSC), October 2017, Yokohama, Japan, pp. 1–8. Real-time object detection using a sparse 4-layer LIDAR, Proceedings of IEEE International Conference on Intelligent Computer Communication and Processing (ICCP), September 2017, Cluj-Napoca, Romania, pp. 317-322. Animal detection from traffic scenarios based on monocular color vision, Proceedings of IEEE International Conference on Intelligent Computer Communication and Processing (ICCP), September 2017, Cluj-Napoca, Romania, pp. 363–368. Superpixels in Pedestrian Detection from Stereo Images in Urban Traffic Scenarios, Proceedings of the 11th Joint Conference on Computer Vision, Imaging and Computer Graphics Theory and Applications, 2016, Rome, Italy, pp. 501-508. Shape improvement of traffic pedestrian hypotheses by means of stereo-vision and superpixels, Proceedings of IEEE International Conference on Intelligent Computer Communication and Processing (ICCP), September 2015, Cluj-Napoca, Romania, pp. 217-222. 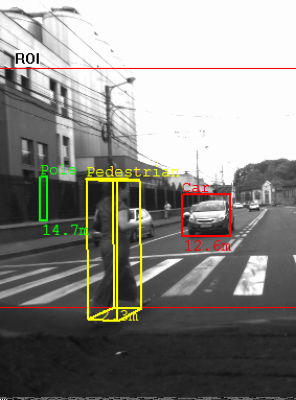 Pedestrian Detection in the context of Multiple-Sensor Data Alignment for Far-Infrared and Stereo Vision Sensors, Proceedings of IEEE International Conference on Intelligent Computer Communication and Processing (ICCP), September 2015, Cluj-Napoca, Romania, pp. 385-392. Body gesture validation using multi-dimensional dynamic time warping on Kinect data, Proceedings of IEEE International Conference on Intelligent Computer Communication and Processing (ICCP), September 2015, Cluj-Napoca, Romania, pp. 301-307. Height restriction barriers detection from traffic scenarios using stereo-vision, Proceedings of IEEE International Conference on Intelligent Computer Communication and Processing (ICCP), September 2015, Cluj-Napoca, Romania, pp. 209-215. Superpixel-based obstacle segmentation from dense stereo urban traffic scenarios using intensity, depth and optical flow information, Proceedings of IEEE 17th International IEEE Conference on Intelligent Transportation Systems (ITSC), October 2014, Qingdao, China, pp. 1662-1668. UV disparity based obstacle detection and pedestrian classification in urban traffic scenarios, Proceedings of IEEE International Conference on Intelligent Computer Communication and Processing (ICCP), September 2014, Cluj-Napoca, Romania, pp. 119-125. Multi-feature real time pedestrian detection from dense stereo SORT-SGM reconstructed urban traffic scenarios, Proceedings of International Conference on Computer Vision Theory and Applications (VISAPP), January 2014, Lisbon, Portugal, pp. 131-142. Traffic road obstacles detection based on analysis of relative motion vectors, in ACAM: Automation, Computers, Applied Mathematics, vol. 22, issue 2, pp. 217-224, 2013. Obstacle Detection Based on Single Frame Stereo Vision, in ACAM: Automation, Computers, Applied Mathematics, vol. 22, issue 2, pp. 247-256, 2013. Urban traffic dense-stereo obstacle classification using boosting over visual codebook features, Proceedings of IEEE International Conference on Intelligent Computer Communication and Processing (ICCP), September 2013, Cluj-Napoca, Romania, pp. 111-116. Pedestrian detection from traffic scenes based on probabilistic models of the contour fragments, Proceedings of IEEE International Conference on Intelligent Computer Communication and Processing (ICCP), September 2013, Cluj-Napoca, Romania, pp. 95-102. A solution for probabilistic inference and tracking of obstacles classification in urban traffic scenarios, Proceedings of IEEE International Conference on Intelligent Computer Communication and Processing (ICCP), August 2012, Cluj-Napoca, Romania, pp. 221-227. Modeling the behavior of large scale reasoning systems using clustering and regression, Proceedings of IEEE International Conference on Intelligent Computer Communication and Processing (ICCP), August 2011, Cluj-Napoca, Romania, pp. 163-169. Real Time Stereo Vision Based Pedestrian Detection Using Full Body Contours, Proceedings of IEEE International Conference on Intelligent Computer Communication and Processing (ICCP), August 2009, Cluj-Napoca, Romania, pp. 79-86. Building Pedestrian Contour Hierarchies for Improving Detection in Traffic Scenes, International Conference on Computer Vision and Graphics (ICCVG), November 2008, Warsaw, Poland, published in Computer Vision and Graphics - Lecture Notes in Computer Science 2009, Springer-Verlag, vol. 5337, pp. 154-163.